The New Centennial Water Source-Kaliwa Dam Project (NCWSP) is a water supply project proposed by the Philippine Government to be implemented by the Department of Public Works and Highways (DPWH). Its main objective is to construct a new water source to meet the increasing water demand in Metro Manila and partially relieve the capital’s dependence on Angat Dam¹. The project dates back to the Marcos era. In November 1978, after the deferral of the Marikina River Project which likewise involved the construction of a dam for an additional water source, the Kaliwa River Basin was found to be a more viable site for the MWSS development project2. Two diversion tunnels were constructed in 1984 then faced numerous postponements and renewals since then. Its current form and scope was approved by the National Economic and Development Authority (NEDA) Board in May 2014. The proposition was strengthened due to the Aquino administration’s claim of a projected water shortage in Metro Manila come 2021. As of February 2018, the government is set to start the construction of a major component of the NCWSP—a ‘legacy’ water project led by the Metropolitan Waterwork and Sewerage System (MWSS) involving the building of the Kaliwa Dam in Brgy. Pagsangahan, General Nakar, Quezon and Brgy. Magsaysay, Infanta, Quezon3. The original proposal included the construction of a second dam called Laiban Dam, which would complement Kaliwa Dam in a much larger, integrated water supply scheme. It will encompass the Kaliwa Watershed which has been identified by the Southern Sierra Madre Wildlife Center of the Environmental Studies Institute of Miriam College as one of the priority biodiversity conservation sites in the Sierra Madre Biodiversity Corridor (SMBC)4. Currently, only the first phase of the project, that which involves Kaliwa Dam and its corresponding water supply tunnel, has been given the green light5. This project is among 75 flagship projects under the Duterte administration’s ‘Build, Build, Build’ infrastructure program. The project’s funding source is official development assistance coming from the Chinese government. Three Chinese contractors and companies have been bidding for the project since March. However, during the months of its bidding process, an unsolicited offer from Japanese group proposing a ‘more cost-effective’ build-operate-transfer arrangement was brought to the table⁶. Once the funding arrangement is settled, the proponents are keen to set the project in motion immediately. These development projects that privatize our basic services for profit present tantalizing promises of better resource allocation and security of livelihood but the brunt of its repercussions is shouldered by the indigenous peoples whose ancestral domains they routinely seize. Along with these profit-driven schemes are the eventual displacement of residents due to a lack of relocation plan, the obliteration of the environment, the rapacious expenditure of natural resources, and the toll on its biodiversity. 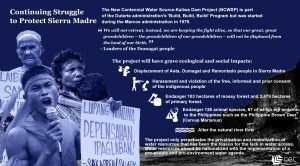 The indigenous communities, such as the Aeta, Dumagat and Remontado tribes in Sierra Madre continue to oppose these projects. However, they are still forcibly carried out through bribery and harassment, a blatant violation of the process for free, prior, and informed consent, says Jill Cariño, executive director and convenor of the Philippine Task Force for Indigenous Peoples’ Rights (TFIP) when the network submitted a petition to stop mega dam projects to the House of Representatives. The project will also endanger 103 hectares of mossy forest and 2,479 hectares of primary forest, according to Haribon Foundation⁷. These forests are home to 126 animal species, 67 of which are endemic to the Philippines such as the Philippine Brown Deer (cervus marianus) and 12 endemic to Luzon only such as the Luzon Bearded Wild Pigs (sus philippensis). It will alter and curb the natural river flow which will not only reduce its capacity to provide basic ecological services but also give way to the risk of malaria, among other water and insect-borne diseases. Thousands of hectares currently used for mangrove fish sanctuary and farm irrigation in the towns of Quezon will be destroyed as well. With the implementation of this project, the Save Sierra Madre Network Alliance also anticipated the loss of a total of 37,700 hectares of the country’s remaining forest cover, consequently increasing the risks of flooding and air pollution⁷. The lack of respect and recognition of indigenous peoples’ rights and environmental protection has made up the deeply embedded inclination found among government leaders. As seen in this project’s financing, it is evident that this is one of the Duterte administration’s strategies to keep ties with China amicable and ultimately, profitable. Government agencies should refuse to be instruments to normalize the deliberate disregard for their needs and demands. The continuous enforcement of the privatization and monopolization of the country’s water resources is the main cause of the lack of access to water. To resolve this, the water industry should be nationalized along with the implementation of a pro-people and pro-environment water agenda. In spite of the challenges local communities are facing, unfaltering clamour against this political and social climate seemingly geared to cripple IPs and natural resources for corporate interests takes the form of organizations such as TFIP and Protect Sierra Madre Network and Alliance. It is through these organizations’ initiatives that the struggle for IP rights along with genuine environmental conservation of IP ancestral domains among others is kept alive. “We will not retreat, instead, we are keeping the fight alive, so that our great, great grandchildren – the grandchildren of our grandchildren – will not be displaced from the land of our birth,” said a Dumagat woman at the National Forum on Laiban Dam and other Megadams. New Centennial Water Source – Kaliwa Dam Project. Republic of the Philippines Metropolitan Waterworks and Sewerage System Corporate Office, n.d., http://mwss.gov.ph/projects/new-centennial-water-source-kaliwa-dam-project. Laiban Dam Project Chronology of Events (PDF). pcij.org. Philippine Center for Investigative Journalism. July 2009. Archived from the original (PDF) on 2013-08-20. Gov’t soon to start construction of P18.7-B Kaliwa Dam project. Manila Bulletin, Madeline B. Miraflor, February 15, 2018, https://business.mb.com.ph/2018/02/15/govt-soon-to-start-construction-of-p18-7-b-kaliwa-dam-project/. Floral survey of Laiban sub-watershed in the Sierra Madre Mountain Range in the Philippines (PDF). Journal of Tropical Biology and Conservation, Villegas, Karl L.; Pollisco, Filiberto A., Jr., 2008, Institute for Tropical Biology and Conservation. 4 (1): 1–14. Laiban Dam Project next on MWSS’ PPP list. InterAksyon, Añonuevo, Euan Paulo C., June 11, 2014. MWSS told to weigh Japan’s bid for Kaliwa dam. Manilastandard.net, Manila Standard Business, July 22, 2018, http://manilastandardtoday.com/business/biz-plus/271111/mwss-told-to-weigh-japan-s-bid-for-kaliwa-dam.html. SSMNA’s Position Paper on the Construction of Mega-Dams in Sierra Madre. Save Sierra Madre Network Alliance, Inc., n.d., https://savesierramadre.page.tl/SSMNA-h-s-Position-Paper-on-the-Construction-of-Mega_Dams-in-Sierra-Madre.htm.